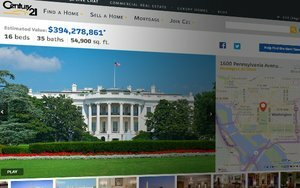 Century 21 is launching a tongue-in-cheek digital campaign encouraging Americans to help decide who will be the new occupants of the White House. The real estate listing might ring a bell: Historic mansion in the heart of DC, 132 rooms, 35 bathrooms and 52 acres; 43 previous occupants dating back to 1800; seeking new residents for Jan. 20, 2017. Regardless of whether or not you agree with either of the presidential candidates, the fact of the matter is that come January 2017 the current tenants will be vacating the White House and the property will be in need of new tenants. The real estate company is encouraging Americans to vote. The brand has posted a listing, where consumers can find all the details on the property complete with a swimming pool, bowling alley and spectacular security detail. They are then prompted to “find the next tenant,” which allows them to find their closest polling location. Century 21 is always looking for clever and unexpected ways to connect with real estate consumers, especially first-time buyers and Millennials, she says. “(They) are increasingly looking to our brand to help them secure their piece of the American dream of homeownership, and this year’s presidential election proved to be a culturally relevant moment in time for us to do just that,” Whitley says. 1 comment about "Century 21 Plays Up New White House Residents". Stephen Homsey from Real Living At Home, November 7, 2016 at 12:29 p.m.